Ever since I heard of their existence I have been eagerly awaiting my first one. I have been like a kid waiting for Christmas Day. I couldn’t wait for that first bite. But allas time went on and I still had not had one. There is a restaurant that opened up that carried them. Nearby, but not that nearby, located at a place that isn’t great for parking and with a baby at home, there isn’t a lot of date nights with the wife. Then everything fell into place. I moved to a new kitchen (and a whole house that goes with it) that has 3 times the counter space. Alton Brown began his new series Good Eats Reloaded, which featured the object of my desire. So finally, I did it. I MADE BONUTS!!!!! 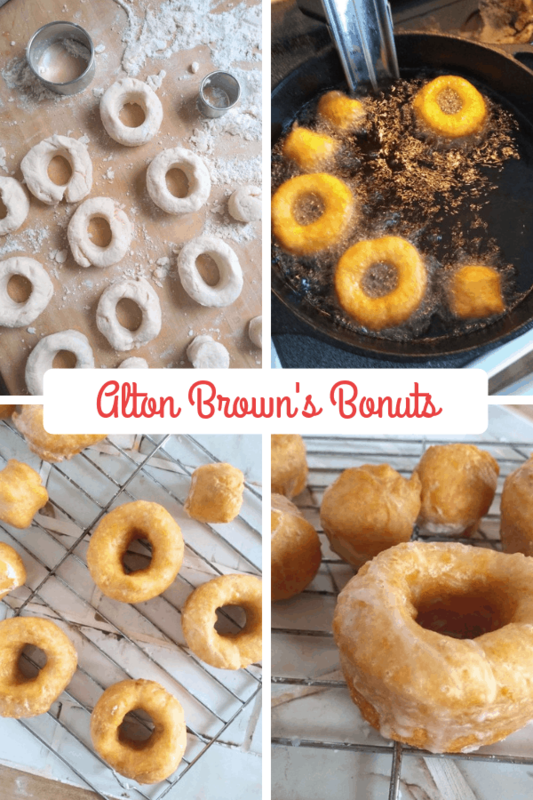 Let me share with you what it was like to make bonuts. It’s key to have that potential for a good rise when you are deep frying. Your cook time is limited compared to baking. So you need that dough to have some get up and go. This dough does. I had always seen Alton use chop sticks when deep frying. It seems like a good idea. I bought some wooden chopsticks and discovered it was a great idea. Flipping over the bonuts as they cooked was so much easier with the use of chopsticks. Now if only I could actually use then to eat with so I wouldn’t embarrass myself at our favorite dumpling and noodle restaurants! The recipe calls for peanut oil. This was actually my first time frying with it. 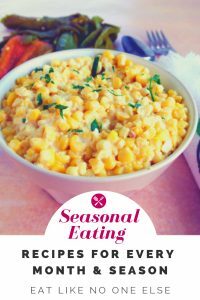 When I made them it was close to Thanksgiving and peanut oil is always goes on sale – for those that want to fry a turkey. If you can’t do peanut oil, then choose another neutral high heat oil like grape seed, canola, or vegetable. A refined olive oil (not extra virgin) could work but I think the flavor is too strong. Avocado oil can be used for deep frying as well but the price is usually too much. The recipe you will notice in a moment is in grams. Yes, Alton is really get specific now. Weighting ingredients in grams is actually easier and more accurate than you using cups and teaspoons/tablespoons. Saves on dishes to clean s well. One of the most used items in my kitchen is my scale, so I highly recommend getting one if you don’t already own on (or just start using the one that has been collecting dust). It’s hard to believe how amazing these bonuts are!!! Bonuts RULE! They really do. These were just so amazing. I can’t get over how good they were. It’s the best of both worlds – biscuit and donuts. 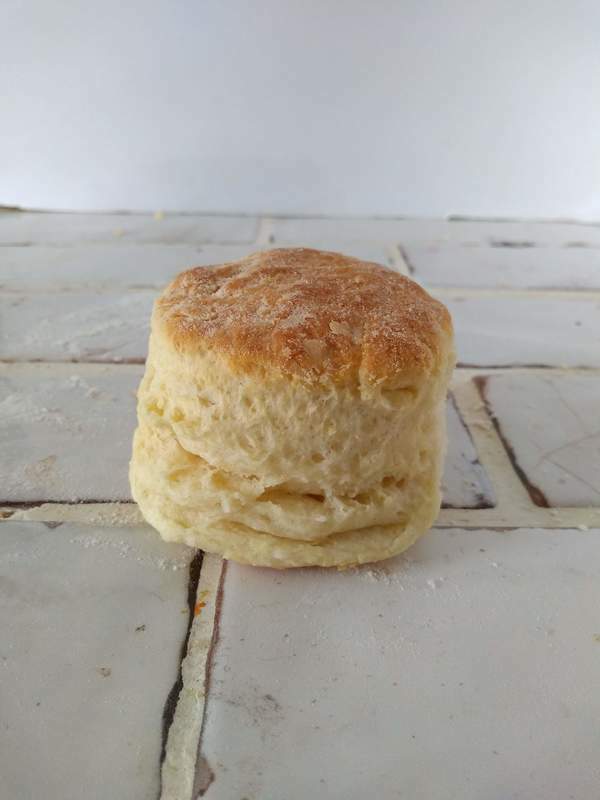 You got those flaky, buttery biscuits layers with the bite of donut covered in a flavorful glaze. While I did enjoy the vanilla glaze, there is still room for improvements. Can you imagine using whole vanilla beans intead of vanilla extract? Oh yeah. Or what about a maple glaze using Bourbon Barrel Aged Maple Syrup? 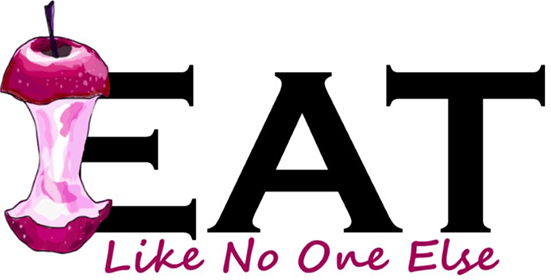 Maybe a little bacon on top to make it a complete meal. Like I said they were good, but like any great artist, having a great canvas to work with opens up many possibilities. Maybe will see more on the blog in the future….. Delicious flaky biscuits, with a hole cut out, deep fried, and covered in a vanilla glaze. Recipe by Alton Brown. Instructions have been written in my own words to reflect the way I do it. Weight out your butter and lard. 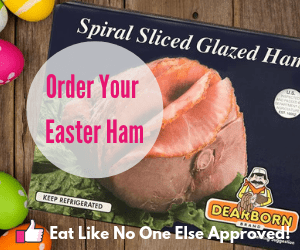 Cut into small pieces and place in the freezer to get really cold. Mix together all the dry ingredients (flour, salt, baking soda, baking powder) in a large mixing bowl. Pull the butter and lard from the freezer and add it to the mixing bowl. Using your finger mix the fat into the bowl until the flour has a coarse texture throughout. Make a well in the center of the bowl, and add in your buttermilk. Sitr just until a dough comes together. Don’t overwork it. It doesn’t need to be perfect smooth. Start in the bowl folding the dough over on itself 2 times. Then remove to a well floured surface. Fold the dough over on itself 8 more times, making sure to turn the dough 90 degrees between folds. With your hands, no rolling pin needed, press the dough into a recentangle that is about 1 inch thick. 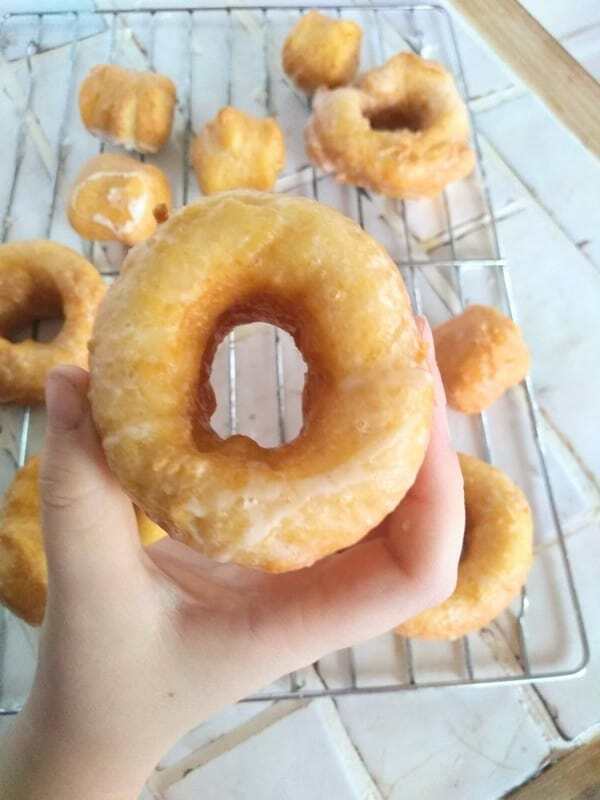 Using a 2 1/4 inch doughnut cutter, make as many bonuts as you can. With a 1 1/4 inch doughnut cutter, cut a hole in the middle. Save the holes, you’ll fry them too. 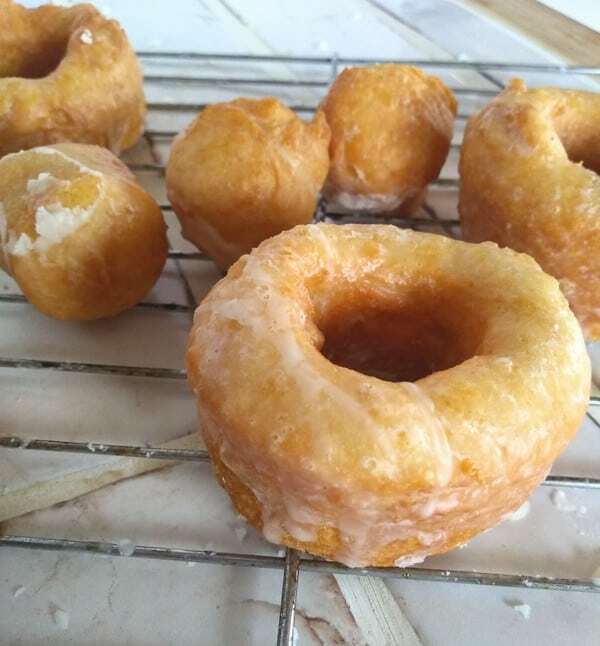 You can re-coll the leftover dough to make more bonuts. Trying to make as many as you can get. They may not look as good as the first batch but they will be delicious. Heat your oil in a large Dutch oven or large pot to 350 degrees. Use a candy/fry thermometer to keep track of the temperature. You could also use an infrared to check it. Add 3 or 4 bonuts into the hot oil. If you have chopsticks use them, they make it easy to add to the oil and make it easy to flip the bonuts. Cook 1 1/2 to 2 mintues per side or until brown and flip. 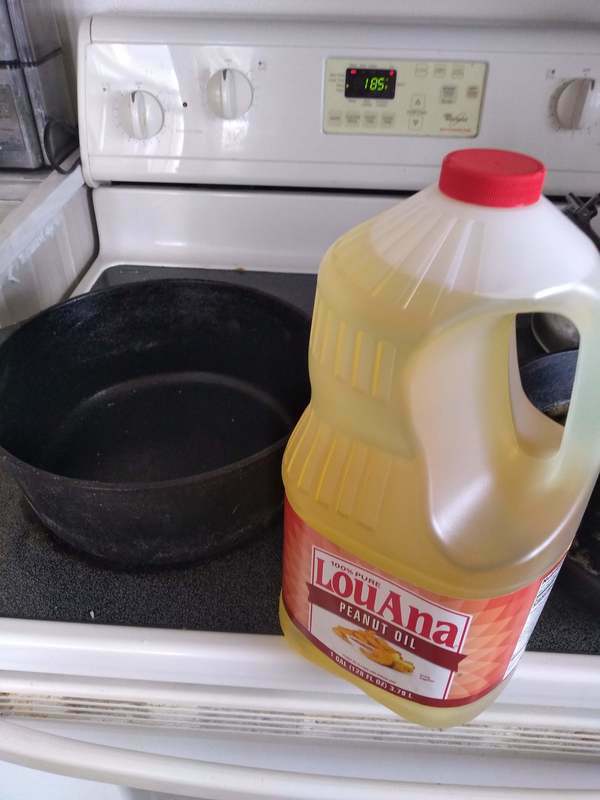 Remove fried bonuts to a sheet pan with a cooling rack on it. Fry in batches until all the bonuts are cooked. Don’t forget to fry the holes too. Mix the milk, powdered sugar, and vanilla extract in a shallow bowl. Beat until smooth. When the bonuts have cooled enough to handle but still warm, dip them into the glaze. Let drain for a moment before putting them back on the cooling rack. When you have finished the bonuts, take the holes and throw them all into the glaze. Mix them around and put them back on the cooling rack. Previous Post: « Where to Buy Sumo (Citrus) Mandarins in 2019?